MRSA Superbug Found On Bedbugs In Vancouver : Shots - Health News Two Canadian researchers have found antibiotic-resistant bacteria living on bedbugs recovered from three people hospitalized in Vancouver. While far from proving that bedbugs can transmit bacterial infections, the findings hint it may be possible. 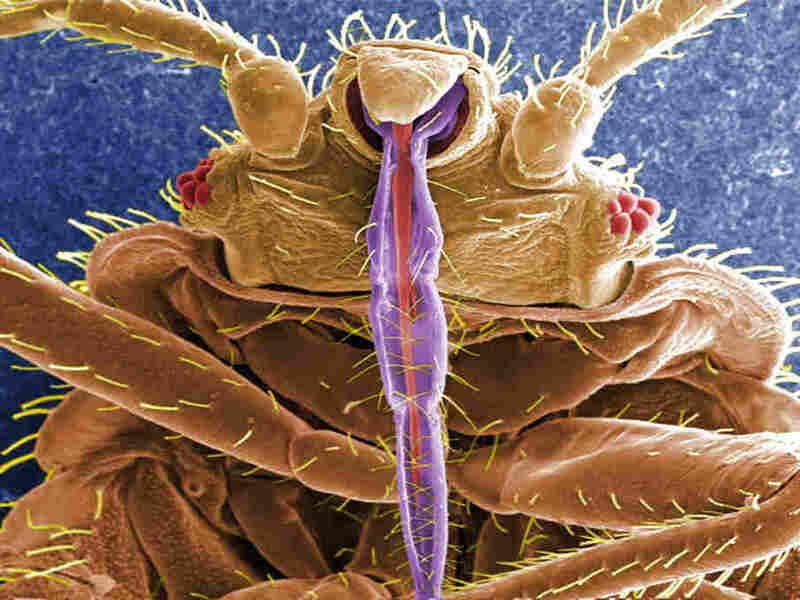 A bedbug, up close, shows off its skin-piercing mouth parts in purple. Bedbugs are just plain nasty. And the tiny bloodsuckers — about the size of Abe Lincoln's head on a penny — are on the rise worldwide for reasons scientists are at a loss to fully explain. So far, I've taken comfort in public health authorities' statements that the critters aren't a hazard to health because they don't seem to spread disease. Now I'm a little uneasy. Two Canadian researchers have found antibiotic-resistant bacteria living on bedbugs recovered from three people hospitalized in Vancouver. Three bedbugs taken from one patient were found to be carrying methicillin-resistant Staphylococcus aureaus, or MRSA. Those bacteria, which are unfazed by many drugs, can cause skin infections, or worse. Two other bedbugs, one each from the other two patients, were found to be carrying vancomycin-resistant Enterococcus faecium, or VRE. To be sure, the MRSA bacteria found are already very common in the poor part of Vancouver where the patients live. More than half of the infections of skin and soft tissue seen in patients treated at the emergency room of the hospital where the research was done test positive for MRSA. And this tiny sample (5!) of tiny bugs doesn't prove they spread the bacteria. "It's possible," Dr. Marc Romney, one of the study's authors, told the Vancouver Sun. But, he cautioned, "We're not there yet by any means, this is just kind of a hint." Still, as Romney and a colleague wrote, the findings suggest that bedbugs have the potential to transmit disease-causing bacteria. The idea seems at least plausible for MRSA, for instance, because the bedbugs break the skin during their blood meals, creating an entry point for the bacteria. The results were just published online by the Center for Disease Control and Prevention's journal Emerging Infectious Diseases.